NASA has activated all the possibilities of close study of the global dust storm that is affecting the planet Mars. 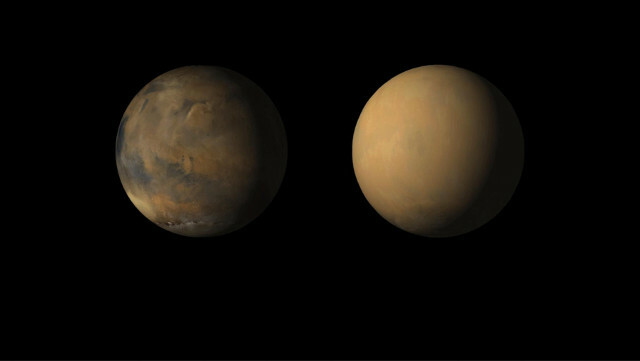 This type of event usually occurs once every three or four Martian years (between six and eight Earth’s years) but it is still unclear how a dust storm that starts on a small scale can grow to the point of enveloping the entire planet. Space probes in orbit are studying the phenomenon in various ways and the Mars Rover Curiosity is collecting data on the ground while the situation of the Mars Rover Opportunity is difficult because it can’t use its solar panels so it went into hibernation. The start of the global dust storm was observed from May 28, 2018 as a small-scale event and then expanded day by day. On June 19, 2018 it was officially reclassified as a global event, which means that at that point the storm enveloped the entire planet Mars. The top image (NASA/JPL-Caltech/MSSS) shows the red planet photographed by the Mars Color Imager (MARCI) camera of the Mars Reconnaissance Orbiter (MRO) space probe on May 28 and July 1, 2018. The amount of dust now present in the atmosphere is considerable and is a serious problem for the good old Mars Rover Opportunity because it prevents sunlight from reaching its solar panels and after some time it also covered them. In recent days, NASA has tried several times to get in touch with “Oppy” but without success, a sign that it entered a mode that could allow it to survive the storm leaving active only a clock that allows it to periodically activate a check of its energy levels to fully awaken it if the batteries are recharging. The only good news for the Mars Rover Opportunity is that the dust that surrounded it acts as an insulator so it could prevent its temperature from falling down to critical levels that would endanger its systems. If Oppy survives the storm, it will still take some time for its solar panels to get cleared by winds enough to recharge its batteries enough for it to wake up. The Mars Rover Curiosity’s situation is different because it uses a radioisotope generator that allows it to always get the energy it needs to work. Some of its instruments are useful to examine the weather, others to study the dust with its concentration and its movements. The bottom image (NASA/JPL-Caltech/MSSS) shows two views from the Mars Rover Curiosity’s Mast Camera (Mastcam) at the site called Duluth on May 21, before the storm began, and on June 17, when it had already invested Gale Crater. The red color of the right photo is due to the dust grains in the atmosphere that filter some colors and a different exposure time needed to take the two photos. The global storm is also being examined by NASA’s space probes orbiting Mars. The Mars Odyssey uses in particular its THEMIS (Thermal Emission Imaging System) instrument to measure the temperature on the surface and in the atmosphere and the amount of dust in the atmosphere. The Mars Reconnaissance Orbiter (MRO) uses in particular the Mars Color Imager (MARCI) instrument to map the entire planet controlling the storm’s evolution and the Mars Climate Sounder (MCS) to measure temperature changes in the various layers of the atmosphere. MAVEN is studying in particular the Martian atmosphere’s upper layers, where the dust doesn’t arrive but there are still consequences. It’s difficult to predict exactly how long a global storm can last. According to scientists it will last at least a couple of months but the information is limited and the most similar precedent is that of 2001. Precisely for this reason, the Mars Rover Curiosity and space probes are gathering as much data as possible in the hope of understanding this phenomenon’s origin and the evolution.